For as long as surgery has been done, the instrument of choice has been the steel scalpel blade. The blade has served us well, but modern technology has brought us another option. The CO2 laser gives us another way to cut tissue that is better than the steel blade in many respects. Steel just cuts. The laser not only cuts, but it simultaneously cauterizes the blood vessels, resulting in much less bleeding. 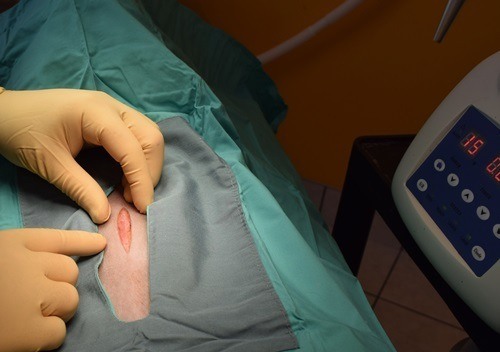 Shown here is an image of an actual surgical incision made here in our clinic with the laser. Notice that it is not bleeding, not even a little. With the laser, because nothing ever really touches the tissue, there is none of the crushing and tearing that happens on a microscopic level even with the sharpest steel. Also, the laser seals lymphatics as it cuts, which also reduces the amount of post-operative swelling. Because the laser vaporizes bacteria, laser incisions are less likely to become infected. And probably most importantly, lasers not only cauterize blood vessels and lymphatics, they seal the nerves as they are cut as well, resulting in less pain. In particular, the laser declaw surgery and the laser dog neuter surgery are done in quite different ways than the traditional scalpel methods. In both cases the new techniques result in fewer complications and more rapid return to function, and we particularly recommend using the laser for these surgeries. Not only that, there is less swelling, less scarring, less bleeding, and a quicker return to function. Not bad for a new-comer to the operating room! Now, laser surgery doesn't eliminate the need for excellent pain medication. Laser incisions still hurt, and there is still great benefit to be had from pre-emptive main management. Laser surgery in another important modality in our multi-modal approach to pain control. Laser surgery adds about $35 to the cost, and we recommend it because of the increased comfort it offers. Click this link to print out a coupon for a free up-grade to Laser Surgery. We are offering this upgrade to our clients free of charge. All you have to do is choose at least two other upgrades, for example Pre-emptive Pain Management, and IV Fluid Support, and you can get the up-grade to laser surgery free.